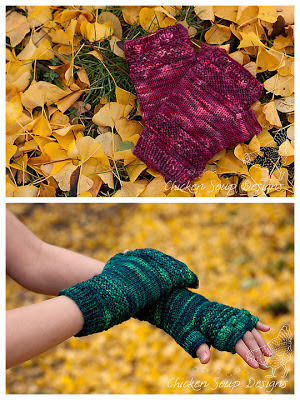 Pattern #1: Fallberry Mitts by Anne Hanson - This was my first time using this particular pattern, and I love the lacy, sophisticated result. The thumb gusset came out spectacular, and her instructions on how to pick up the stitches for the thumb (which I didn’t follow for one glove, and strictly followed for the other) made a huge difference in that little gappy area you get when picking up the thumb on most fingerless mitts or mittens.The ONLY problem I had (which could be remedied by doing these mitts 2-at-a-time Magic Loop) is that it was easy to get lost in the middle of pattern, and end up with some "leaves" that were a tad bit taller than the others (which of course affects the finished length of th glove). Therefore, the next time I make these beauties, I'm doing them 2-at-a-time to preserve my sanity! There just isn't anything bad I can say about this pattern... I adore it. From the complicated looking cabling (that just screams, "I AM A GOOD KNITTER", lol!) 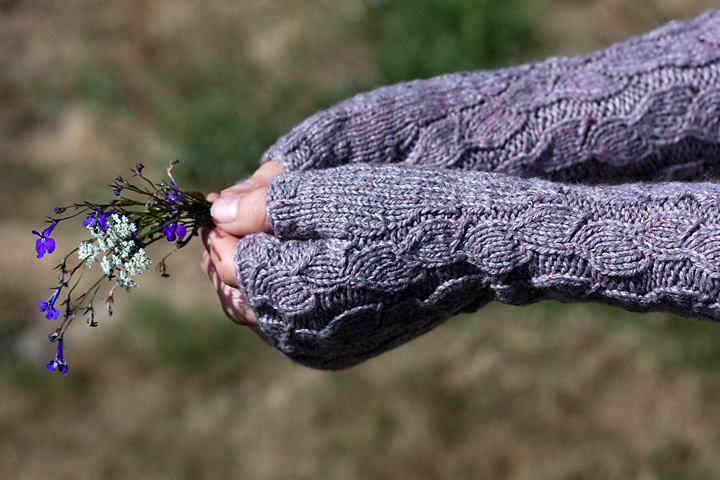 to the nice, stretchy cast on, and purl ridges on either side of the cabling that really pull these gloves in and give them a good fit. 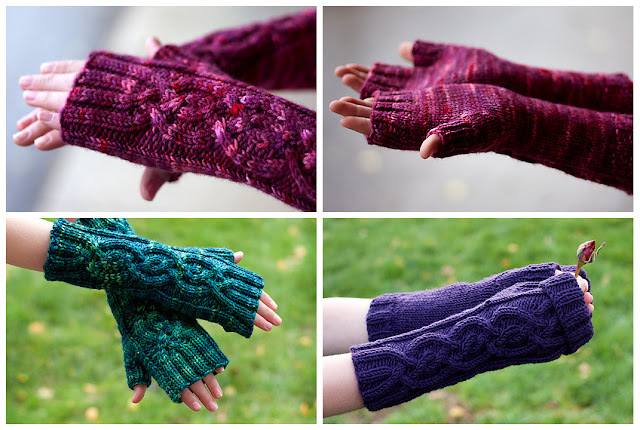 I started off doing these mitts one at a time, but after the 2nd, or 3rd pair, I realized it would save a lot of time doing them 2-at-a-time. I used the “cabling without a cable needle” technique that I learned from grumperina, and I used this video to learn how to do the “circular tubular cast on” by littleturtleknits (this is the cast one suggested by the pattern). This cast on is pretty fiddly, in my opinion, though.. and it just didn't look as smooth as I wanted. I ended up switching to the German Twisted Cast On that I had just used for my Three Willows Cowl. I like the finished look of the German Twisted cast on better, and it is definitely less fiddly (but just as stretchy, in my opinion!!!) I will probably make many more of these in the future! 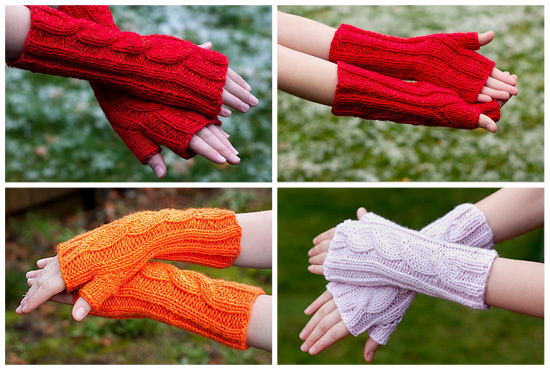 Don't have the time for the more complicated cabling found in the Vancouver Fog mitts? Try these! Done 2-at-a-time via magic loop (with cables reversed, and the thumb gussets put into the correct spot for each glove), you can have these done in a day if you are diligent (and don't have any small children to distract you!) The pattern calls for an Aran weight yarn, and as I only had worsted weight on hand, I had to make some modifications for fit. I went with a size 6 needle, and that fit all of my recipients very well. Also, I did three cable repeats before starting the thumb gusset, and the gloves were too short with the suggested amount of k2p2 ribbing at the end, so I ended up doing almost double! As other Raveler's have noted, the increases for the thumb gusset seem to be reversed (doing them as suggested makes some large holes) so I did a M1R, then a M1L for the thumb. This makes sense when you remember that M1R means that the increased stitch is leaning towards the right and that M1L is leaning towards the left. Now the increases follow the shape of the gusset. 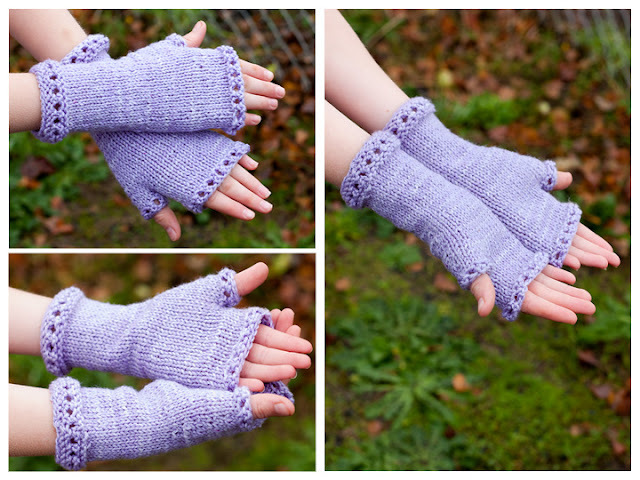 The last pattern I tried (because I loved the little eyelets) was this pattern by Megan Goodacre. The pattern is sized for bulky yarn, so I altered it for worsted by using a size 6 needle, and casting on 32 stitches (my sister has small wrists, and I didn’t want to use a bulky yarn). I also knit several extra rows before starting the thumb gusset (to account for the differences in row gauge), as well as several extra rows after placing the thumb stitches on waste yarn - to make sure that my gloves would be long enough. My sister was thrilled with these at Christmas, and they really turned out very sweet! There you go! A review of all of my preferred fingerless mitt patterns for 2012! May the year 2013 bring many more chances to knit, and new patterns to try! These are so lovely! 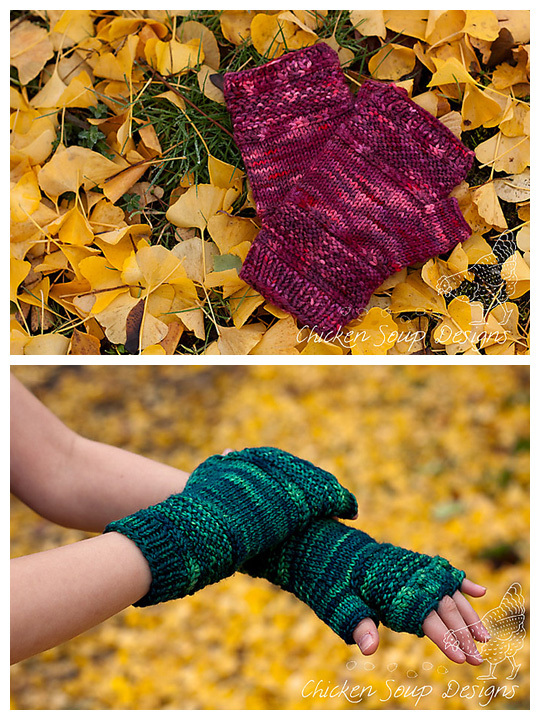 My daughter was so inspired by your beautiful mitts, that she finally broke down and asked me to knit her a pair. I tried the Vancouver Fog pattern and loved the result. Thanks so much for the inspiration. I'm impressed with how many lovely pairs you managed to make!